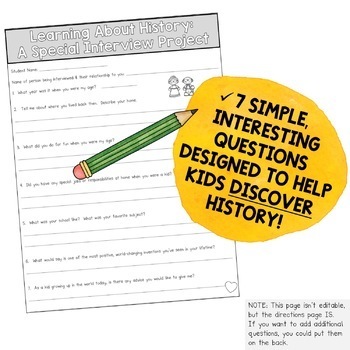 If you’re looking for an engaging, memorable, simple way for your students to discover how life has changed over time (and meet Social Studies standards about life then and now or past and present), this is the resource for you! Ideal for Grandparent’s Day or sending home over the holidays when many families get together, students are given all the tools they need to interview an older family member. Seven simple, thoughtful questions for kids to ask their elder are included along with a couple of direction options (for you to send home and explain the project) that are all completely editable in Google Slides (this way you can personalize the expectations to meet the needs of your unique class and their family situations). Check out the preview for a closer look. 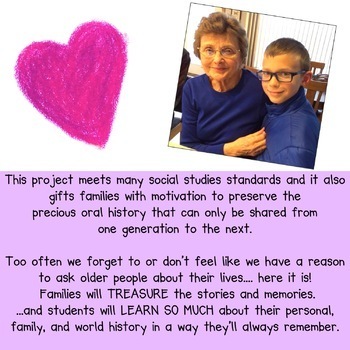 This project meets many social studies standards and it also gifts families with motivation to preserve the precious oral history that can only be shared from one generation to the next. Too often we forget to or don’t feel like we have a reason to ask older people about their lives.... here it is! 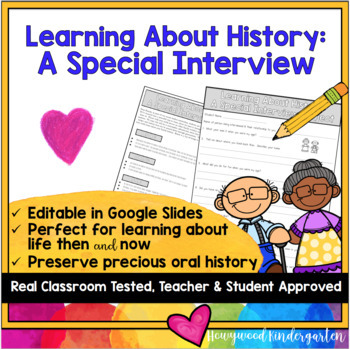 Families will TREASURE the stories and memories ....and students will LEARN about their personal, family, and world history in a way they’ll always remember. As interview notes return to school (and possibly pictures, if you invite families to share a photo), you can have students share about what they learned. You could also display the papers in a book or bulletin board or just send them back home after they’ve been discussed. 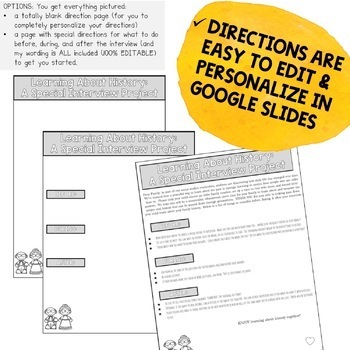 Your Google Slides link and helpful tips for printing are all included in this purchase.